by Alberto Dello Strologo et al. The driving force behind the cluster effort for a biannual peer-reviewed International Journal of Management and Transformation (IJMT) is in search of better perceptive of management-transformation-development policy linkages. 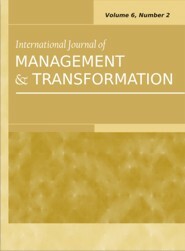 The journal is designed within a distinctive, interdisciplinary focus on the interrelationships between policies, planning and process of development of different aspects of management thoughts in the context of global, regional and local change and transition, which are due to concern for the interaction of macro development strategies and structure, and processes at the meso and micro levels.